A walk up the tree-lined track on the western flank of Mt Innes is rewarded by excellent views from the top. Facing west, one looks out over the plains as far as the Grampians on a clear day, with Langhi Ghiran, and Mt Misery in the middle distance and the township of Buninyong in the valley below. (Curiously, Buninyong cannot be seen from the public viewing platform on Mt Buninyong, due to the steeper angle of vision.) Immediately behind, almost due east, is the summit of Mount Buninyong. The Buninyong extension of The Great Dividing Trail, running from the Gong along the eastern extension of the Yuille Street Reserve and up the Mt Innes track, was opened in November 2007. Interesting drystone rock walls in this area are also worth seeing, some running up amazingly steep slopes. Some are in poor condition, with the rocks falling down or being removed, some have been recently restored, and some have been newly built. 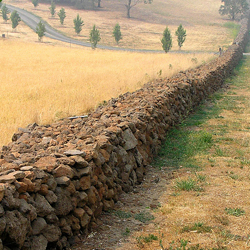 The early rock walls were built without mortar by skilled wallers employed by the early station owners to clear the many volcanic rocks from their properties and to define their boundaries at the same time. In recent times the art of rock walling has been revived and more people now appreciate their historic and visual importance to the district. Hastie's Hill and Mt Innes consist of two adjoining areas with individual titles. Both are managed by the City of Ballarat. Hastie's Hill (also sometimes known as Lock's Hill, Birdwood Park or Mt Innes) has an area of eight acres bounded on the north by the Midland Highway, in the south by Hastie's Road, and on the east by Innes Lane and in the west by five acre blocks running down the slope to Lal Lal Street. In the early surveys it is designated as a Water and Recreation Reserve. Hastie's Hill was presumably first named because of its location directly to the east of the Reverend Hastie's first Log Kirk and School in 1847. The Hill is undulating basaltic ground rising to a central summit, and provides magnificent views to the west overlooking the Buninyong township and surrounding countryside as far away as the Pyrenees and even Mt Emu and the Grampians on a clear day. On account of this, a Mayoral Seat was built around one of the summit trees and past councillors would take their guests to this spot to admire the Township. Over the years the name of the Reserve was sometimes changed to honour visiting Governors and other celebrated people. Towards the end of the First World War, the Reserve became a Memorial Park to honour the Shire residents who had served in that conflict. Accordingly it was renamed "Birdwood Park" after the Commanding Officer of the ANZAC Forces. There is a commemorative planting of a small Memorial Avenue of oaks and poplars near the north boundary and scattered Monterey pines mainly on the hill section. In between the Wars, school children would visit the Park on Empire Day and place floral tributes beside the trees. The area was leased for grazing by the former Shire of Buninyong. In 1980 the Shire of Buninyong developed a program to enhance the Shire's various assets, and in a manner somewhat similar to the Mayoral Seat, a picnic setting and path were constructed. The existing path starts on the high ground on the northern side of Innes Lane but from observation and old records it appears that the original path started on the southern side of the lane and gradually ascended the hill by a circular route. 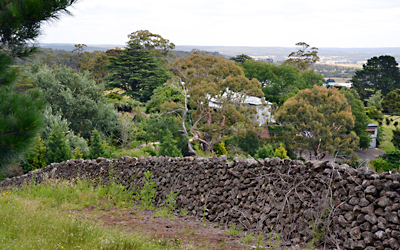 A pioneer settler, George Innes, known as "king of the Wood Splitters", donated the five acre block on the western side to the people of Buninyong. Over the years he acquired much land and the property "Cairney Lane" at Pound Creek. A basalt stone on the boundary of Mt Innes records the gift of land in 1894. 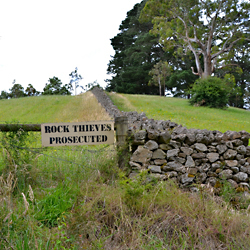 An area of Crown Land, 5 acres designated as a Water Reserve and adjacent to Hastie's Hill, separated east-west by the continuation of Hastie's Road, which continues eastward along a grassy track bounded by stone walls. A north-south dirt road cuts through the Crown Land, leading to some recently constructed houses. The spring is situated under a canopy of a large eucalypt and located off centre on the east side of the north-south road. The spring has been timber lined, some of which is still visible. There was a tragedy when a little girl, Harriet Holmes, was drowned in the spring in 1883. To lessen the chance of this re-occurring, stones were put in the water to reduce the depth. Hastie's spring rarely fails and besides being an excellent source of water for the Pioneers living in that part of Buninyong, the area was a popular picnic ground. Today the neighbouring properties either pump from the spring well or use the run-off for their gardens. The area is of historical significance because of its association with the Reverend Hastie beginning in 1847. At present the area is overgrown and neglected.